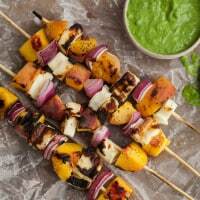 Grilled Peach and Halloumi Skewers with Basil-Jalapeno Sauce | Naturally.Grilled Peach and Halloumi Skewers with Basil-Jalapeno Sauce | Naturally. To make sauce, combine ingredients in a blender or food processor and run until pureed. Serve skewers with basil puree.